We hope that you will come and enjoy our productions. 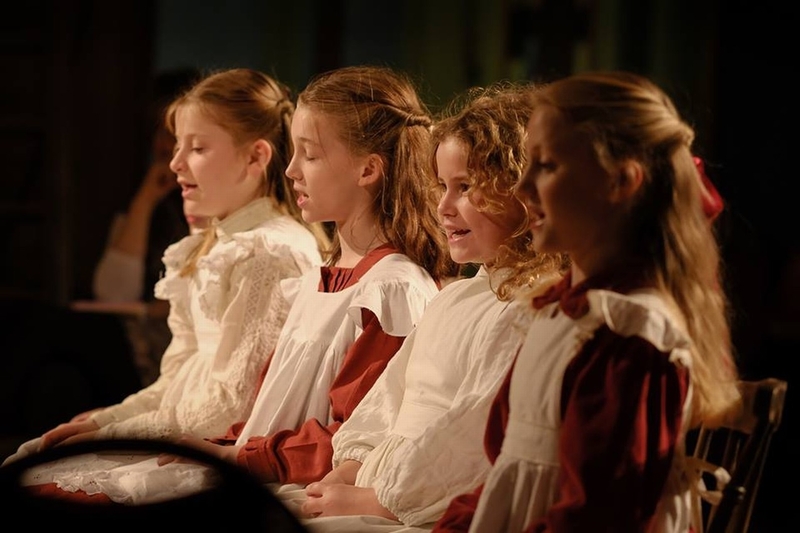 Faringdon Dramatic Society has been entertaining the local community for over half a century and the standard of acting has often been compared to that seen at a professional theatre. The society has been the proud winner of many county and national awards. And it isn’t all about the acting! We are also often complimented on the excellent quality of the stage set, make-up and costumes used in our productions. You may be surprised to hear that all are created specially ‘from scratch’ for each production by the hard working ‘behind the scenes’ members of our society. Why not come and join us? Everyone is welcome. Please note that tickets may not be available here on the day of the performance. Saturday 11th May 2019 - Canadians arrive; followed by a barbecue on Sunday 12th to welcome them. Members only. 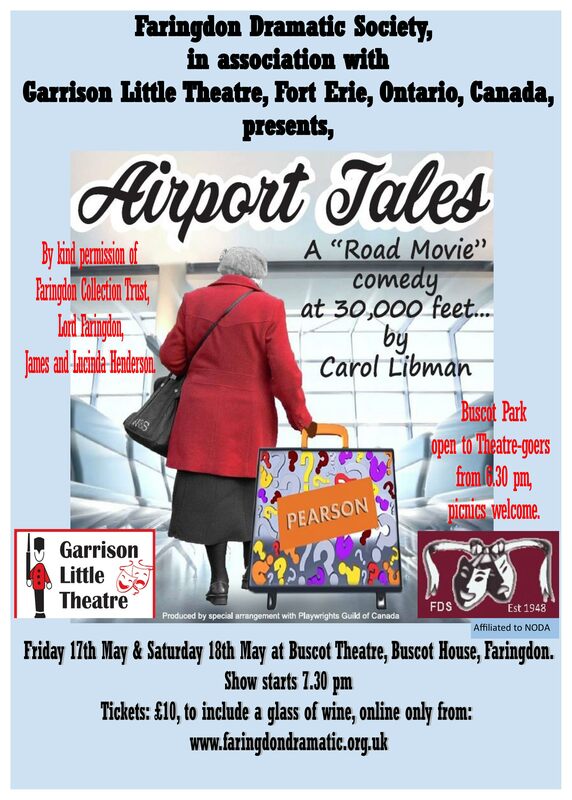 Friday 17 & Saturday 18th May 2019 - "Airport Tales" by Carol Libman, a light-hearted comedy - in collaboration with the Garrison Little Theatre from Fort Erie, Ontario, Canada at Buscot Park Theatre. Due to limited seating members will be invited to a preview (dress rehearsal) performance on the Wednesday before. May 2019 - AGM. All members and prospective members welcome. Nibbles and drinks provided. 12-14th July 2019 - further performance of "Shakers" by John Godber at the Follyfest. September 2019 - summer BBQ. Members plus families only. October 2019 - auditions for next year's panto. Production not yet decided - if anyone has a script in mind and fancies directing, now’s your chance. November 2019 - performance of "Our Country's Good" by Timberlake Wertenbaker. Saturday 14th December 2019 - Christmas dinner evening at Sadlers. Members only. We are always pleased to welcome new members. As well as acting and directing there are always opportunities to help with set building, front of house, and much more. No experience is necessary. Just come along to any reading, audition or performance published on this website and introduce yourself. Whether you want to be in a play or just help back stage or front of house you will always be made welcome. What has FDS ever done for us? As a member of Faringdon Dramatic Society you can ... read more (FDS-MembershipBenefits.pdf). 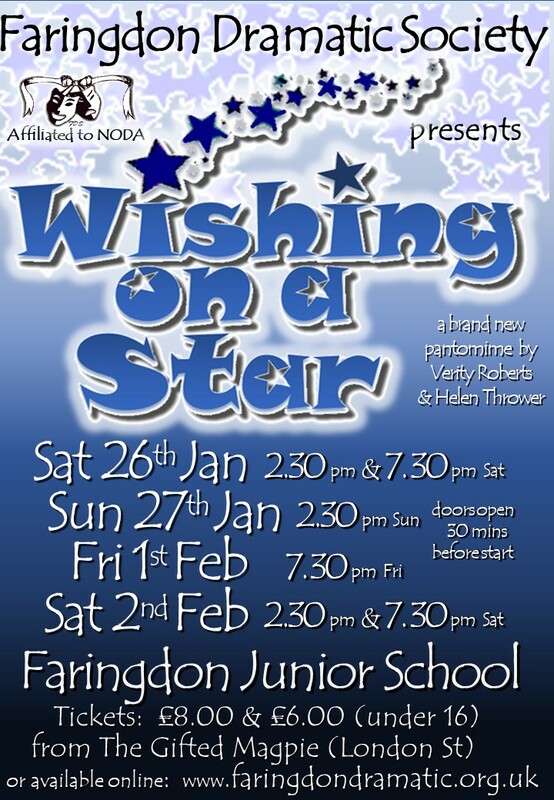 Want to put your daughter/son on the stage for our pantomime? - click here. We are always looking for suggestions from members for play readings and offers to direct plays of your own choice. Plenty of help is always available if you haven't directed before. Please contact us with your ideas. Faringdon Dramatic Society currently have an exchange partnership with the Garrison Little Theatre in Fort Erie, Ontario, Canada. Three times now they have come here and we have gone there to put on a production. We are looking forward to meeting them again in May 2019 for a fourth time with their production of 'Airport Tales'. GLT first came to Faringdon in September 2007 to perform 'Lend Me a Tenor'. Then again in October 2011 to perform a joint production of 'London Suite', followed by ‘Office Hours’ in May 2015. FDS first went to Fort Erie in May 2008 to deliver a performance of 'Outside Edge', done here two weeks earlier. Then again in June 2012 to repeat the joint production of 'London Suite', done here the previous October. Then followed in June 2016 with 'Side Effects'.